Today’s gospel (John 9:1-41) offers multiple possibilities for a sermon. We could talk about the disciples’ question and the relationship of sin and this man’s blindness. Is it a punishment? Is that how God is? Or we could talk about Jesus making a mud salve for the man’s eye. What’s that about? It offers a sermon on healing. I was blind and now I see. What’s that all about? Another sermon could focus on the man’s neighbors and their failure to recognize him. Can they only see him as a blind beggar? Another sermon might look at Jesus as a law breaker, one who heals on the Sabbath. Another possibility might be the man’s parents’ fear of the religious authorities and how religious institutions too often instill fear in people. Or we might consider why the religious authorities are not able to conceive of God acting in ways that do not fit their experiences and expectations. Are we open to God surprising us? The formerly blind man’s confession of faith, “Lord, I believe,” offers another sermon possibility. That’s eight possibilities, and I am sure there are more. The good news for you today is that I don’t intend to try and cover all those. I wanted to name a few of the other possibilities, to tell you where we not going with this text so we can let those go, so they don’t become a distraction, so we can narrow our focus. Today I want to talk with you about Jesus as a prophet who comes for judgment and what that might mean for us. What does a prophetic Jesus have to say about you and me, our country, our world? What is his judgment? Jesus as prophet and judgment get to the heart of the questions I think many of us are asking today. In light of the Prophet Jesus and his judgment, what are we to make of what is happening with security, border control, healthcare, refugees, hunger, poverty, violence, and war? How are we to respond to these? What about our responsibility to one another? How might Jesus as prophet help us there? I think the Prophet Jesus and his judgment have something to say about what it means to be a neighbor, especially to those who differ from, frighten, or threaten us. The last six or seven weeks have brought this parish a lot of sadness and pain. I think the prophetic Jesus and his judgment have something to say about the recent deaths we’ve experienced; the loss and fragility of life. What are the values that guide our lives and decision making? What are faithful choices and how then are we to live? The one who comes for judgment guides our way. We face these questions and issues as individuals, a nation, and a world. The scale might vary but the struggles are the same. Prophets and judgment tend to make us a bit uncomfortable. Prophets speak words we often do not want to hear. They show us truths we often do not want to see. They ask us to change. And judgment often leaves us thinking about wrong doing and punishment. Prophets generally do not work within the system, but often stand outside the system and work against the injustices and abuses perpetrated by the system. Prophets speak against that which diminishes human dignity and impoverishes life. Think, for example, of the prophetic work of Martin Luther King, Jr, in America, Gandhi in India, Archbishop Oscar Romero in El Salvador, or Archbishop Desmond Tutu in South Africa. They called the people of those times and places to see anew and live differently. Behind each of them stood the Prophet Jesus, and they made present his judgment. On a smaller more personal scale think about the people who have spoken a difficult truth to you, called you to change, or offered you words of consolation and hope, and in so doing opened your eyes to a new life, a new seeing, a new understanding, a new faith. They too were prophets with whom Jesus stood. They too presented Jesus’ judgment. We don’t often think or speak of Jesus as a prophet and yet that’s exactly how the man who has been given new sight sees Jesus. “He is a prophet,” he tells the Pharisees. Jesus affirms the man’s seeing. “I came into this world for judgment,” he says. That’s what prophets do. They open our eyes to see what is, and cast a vision of what might be. Their judgment stands in the gap of those two seeings. They call us back to our truer selves. Prophets remove the cataracts from our eyes. They offer us clarity and insight. They challenge us to not look on outward appearances, but to look deeper; to see as the Lord sees, and look on the heart of the person or situation (1 Samuel 16:7). That’s the judgment for which Jesus comes; that we might see the world, one another, and ourselves differently. The judgment for which Jesus comes into this world is not so much a judgment about good or bad, right or wrong, in or out, saved or damned. It is a judgment about our seeing. Today’s gospel tells us the man born blind had his eyes opened, with the implication that they had been closed. This is not about physical sight. This is about spiritual seeing. Do we see with eyes opened or do we see with eyes closed? For most of us, I suspect, the answer is yes. Sometime we see with our eyes open and other times we see with our eyes closed. When we live and see with our eyes closed we withhold mercy, live in fear, let anger control our lives. When we are unforgiving of ourselves or another we see with eyes closed. Sometimes we either refuse or are unable to see the pain or needs of another. We’re too busy to respond, to important to deal with it, to afraid to risk it. In those times we see with closed eyes. When we love ourselves more than our neighbor we are seeing with eyes closed, blind to the value of the other’s life. When violence becomes our default response we are seeing with closed eyes. In all those and a thousand other ways we see with our eyes closed. We focus on the outward appearances but neither feel nor establish an inner connection with the person or situation. Other times we recognize the injustice of a situation, we feel the other’s pain as our own, we see the needs and life of another as valuable and important as our own. In those times we are seeing with eyes open. When we offer peace, forgive, act with compassion we are seeing with eyes open. Our eyes open when the news of another bombing makes us sick to our stomach, when we refuse to participate in the same old agenda-based conversations, when we reach out to make amends with someone we’ve hurt. In all those and a thousand other ways we see with our eyes open. In those times we are looking beyond outward appearances. We are seeing as God sees, and looking into the heart of the other person or the situation. Jesus did not say that he came into this world to make judgments, but “for judgment.” His judgment is not a series of individual decisions. Rather, his very life and presence are the judgment. His Word is a judgment on our own words and the rhetoric of our leaders. His compassion is a judgment on our indifference and apathy. His justice is a judgment on injustice. His nonviolence is a judgment on our violence. His mercy is a judgment on condemnation. His forgiveness is a judgment on guilt. His welcome is a judgment on exclusion. His hope is a judgment on despair. His reign is a judgment on the politics of the day. His seeing is a judgment on our blindness. His light is a judgment on darkness. His life of prayer is a judgment on our attempts at living self-sufficiently. His simplicity is a judgment on our overly busy and cluttered lives. His truth is a judgment on lies, falsehoods, and alternative facts. His wholeheartedness is a judgment on our fragmented and divided world. His self-surrender and crucifixion are a judgment on the powers that be. His resurrection is a judgment on death. Everything about Jesus, his life, his words, his actions, are a judgment on our lives and world. That judgment offers us the chance to see as he sees, to live as he lives, and to be as he is. His judgment, however, is not an adjudication for the purpose of punishment. Rather, it is a diagnosis for the purpose of healing and life. Jesus always casts his judgment with an eye toward change and transformation. Its purpose is to show us the way, the truth, and the life. Jesus’ judgment is not a once and forever judgment. It’s conditional. It lasts only as long as we see with eyes closed. And there is no one as blind as the one who chooses not to see, who chooses to live and see with eyes closed. We need only look to the recent past to understand what happens when we see and live with eyes closed. Let’s not be closed eyed people. Let’s see with open eyes. Let’s see the beauty, the hope, the goodness. Let’s see the pain and disfigurement. Let’s take it all in, and then, by God’s grace, let’s begin to close the gap between what is and what might be. Love lies at the heart of Jesus’ judgment. With open eyes he sees in us more beauty, more goodness, more holiness, than we often see in ourselves and each other. His judgment in intended to open our eyes to see anew; a new life, a new world, and new possibilities. What we often don’t understand is that his judgment is in our favor and for our good even when it doesn’t feel that way. He is a prophet who has come into this world for judgment. 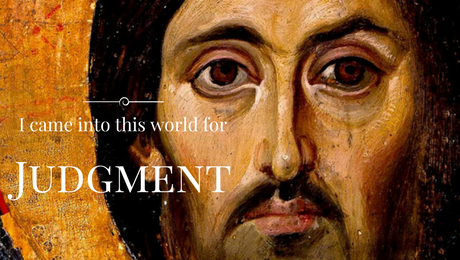 Where does Jesus’ judgment intersect your life? My life? What is it asking of us? Where does our seeing diverge from his seeing? What possibilities and hope does his judgment offer you and our world? “Surely, we are not blind, are we”? Bailey and I read your sermon this morning, great as always. Thank you for posting them since we cannot hear you in person. I am praying that we can go to church Easter Sunday but taking one day at a time. Thank you Kay. I too hope you can be here on Easter. We’ve missed you all.